The open floor plan includes new tile flooring throughout, a beautifully remodeled kitchen with granite countertops, new appliances and cabinetry, and all utensils making cooking a breeze! A full laundry with new washer and dryer, and updated bathrooms make this a highly sought after vacation home..
Comfortably sleeping up to 8, the large master bedroom offers a king sized bed with access to the private balcony. With plenty of closet space, and wonderful views, this is a perfect retreat after a busy day outside. The second guest room has 2 double beds, while the third offers one queen sized bed. All rooms are nicely decorated, comfortable and spacious. Linens, extra towels and pillows are provided for the comfort of our guests. This unit includes four televisions, as well as free WiFi and long distance from Canada and the U.S.
A nice plus: two parking spots are allowed for this unit. 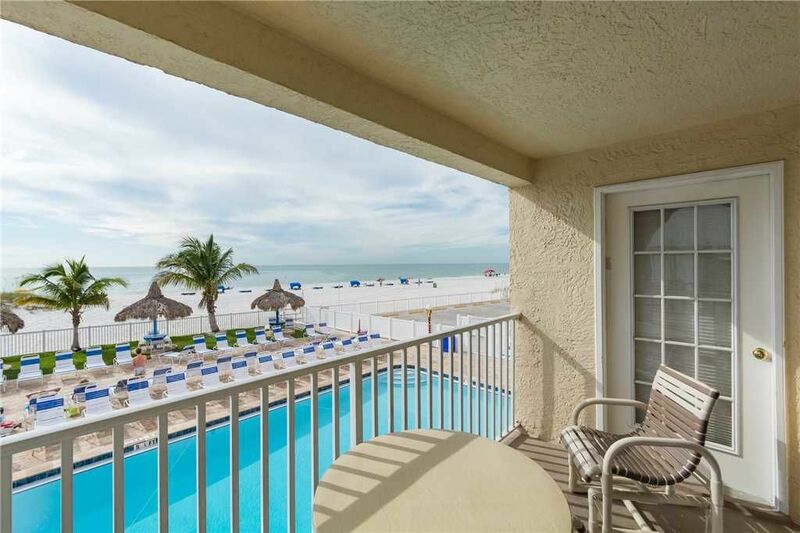 Grab your beach towels and umbrella as the beautiful southern Madeira Beach and heated swimming pool is right outside your front door. Enjoy the BBQ facilities which are located here as well. Of course, John's Pass Village is right across the street. The "Pass" is a quaint turn-of-the-century fishing village and Pinellas County's #1 tourist attraction. The Village has over one hundred unique shops, a variety of restaurants, the local fishing fleet, dolphin watching and shelling tours, boat rentals, parasailing and jet skiing. Best of all as a SunHost customer you can walk to this great entertainment destination. Anchor tenants include Bubba Gumps, Hooters and Hubbards Marina and also world famous Bamboo Beer Garden. It was awesome we will hopefully be back next year. Clean, convenient to restaurants and shops. This is our second year here and it was even better than the last! We love the condo, the pool, everything about the accomodation. The check in was smooth and pleasant. We even were able to get into the condo a bit early. With a toddler and child, this place is perfect and safe. Being in the corner condo, we are able to watch the bridge over the pass open and close. Fascinating for little children! This was our second year staying at Beach Place with our entire family and we had a WONDERFUL time!! The balcony was greatly enjoyed by the 2 year old and the 72 year old, and the 7 year old adored the pool. My sister-in-law and I loved walked on the beach daily and my brother was a fan of walking under to bridge to get over to the boardwalk shops. We also discovered that the VFW across the street serves delicious dinners for very cheap! (It's open to the public, not just members.) We can't wait to come back next year! No one can argue about the location. You can’t get any closer to the sand. However, we weren’t really happy with the condo itself. It’s a 3/2, but what the listing doesn’t tell you is that there is no private master bath. The private bath is in one of the secondary bedrooms. There is a door from the master into the common bath, but at this price point, I expect a private master bath. The listing should make that clear. This may not be a big deal to some people, but it is to us. There was the smell of rotting garbage and a lot of little gnats or flies in the kitchen when we arrived. After placing a lemon on the garbage disposal that seemed to take care of it. This place is loud! The windows and doors do nothing to keep the outside sounds out. The furniture is VERY uncomfortable. The couch cushions don’t stay I place. Even if they did, it wouldn’t make the couch any more comfortable. The bed in the master bedroom is hard, you can feel some of the springs, and it sags badly in the middle. It would have been nice if the beds has more than a flat sheet to cover up with.